Think you’re powerless to save the Earth? Think again. When you salvage a sofa, you save it from going into a landfill. That’s the strategy “indie redesigner” Jeanne Connolly of Vintage Renewal has taken in her quest to save the Earth, and she want to teach everyone her environmentally friendly upcycling tricks. Jeanne realized that if she knew more about how to reupholster vintage furniture, she could “combine that knowledge with her fashion design skills to make a more stylish line of furniture.” She then ventured from NYC back to Denver to take seven straight years of reupholstering and fashion design classes. Now she shares her vision and her skills with her fellow flea market enthusiasts, educating us with how-to tutorials on her website, encouraging us to see the possibilities of our passion—to see saving a beat-up, natural pinewood chair as a small step towards saving the planet. In nine steps, you can recreate one of our favorite environmentally friendly rooms designed by Jeanne Connolly. 1. For Jeanne Connolly, the “stars of the room” are two mid-century modern elements: the sofa she reupholstered with tufted pink fabric and ivory trim and the Carl Gliko abstract acrylic painting on canvas. 2. The Indian kilim rug, Chinese vintage enamelware and hanging antique Chinese water bucket add Eastern flair to the mid-century modern space. 3. 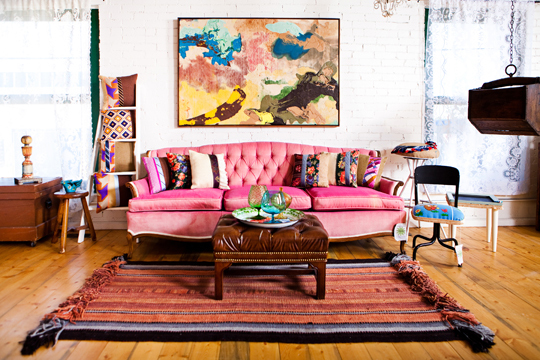 Combining “whimsical and natural hues,” Jeanne created the throw pillows from burlap and vintage scarves and neckties. “The rough burlap and smooth, silky vintage ties and scarves on the pillows offset that brilliantly faded, but still vibrant couch,” she says. 5. 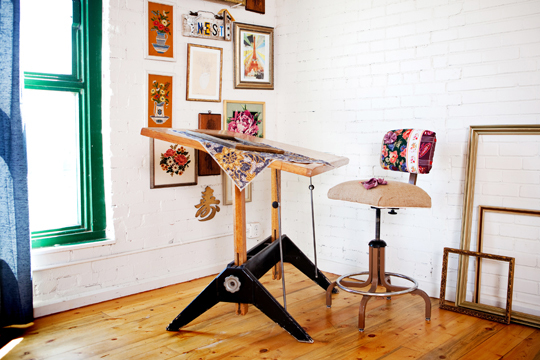 Jeanne upcycled this vintage stool, giving it a new seat cushion and cover made of burlap, a vintage scarf and a necktie. 6. The abstract art is a focal point that ties together the room’s colors and makes a big impact. 7. “A white backdrop is a great canvas for lots of color splashes throughout your space,” Jeanne says. For more great environmentally friendly vintage design ideas from Jeanne Connolly, click here. This entry was posted in Decor Inspiration and tagged design ideas, eco-friendly, environmentally friendly, Jeanne Connolly, mid-century modern, reupholster vintage furniture, reupholstering, salvage, upcycling, vintage, vintage design, vintage design ideas, Vintage Renewal by Flea Market Decor. Bookmark the permalink.